I’m so glad I went part-time at work, because despite not working full time or even training full time cuz of my injury, I’m still insanely busy. I’m not super seriously injured. I think I damaged a muscle in my neck/chest/shoulder and it would get better if I just stopped using it, but you know. I’m focusing on moving, wrapping up my life here in Japan, and seeing all my friends. –fill out paperwork to get my final salary sent to me. But because I’m leaving the country so soon, I won’t be here to access my bank account, so what should I do? –I researched, found Citi bank, and opened a Citi Bank international account, so I can transfer and access funds easier. I did that on Monday. –Have to figure out the cheapest way to mail my belongings back to the US. Have to find boxes. Reduce items. –I have to get my mandatory company medical check tomorrow, but then on top of that, I have to go find a different hospital in addition to that. -_- Get some check ups done while I still have the insurance to pay for it. –Worried about several friends and family. I want to help them. –figure out my phone situation. I have an iPhone that I wanna use in the US, but the jerk-face poopie-heads in the SOFTBANK SHOP told me I couldn’t, and they couldn’t unlock the SIM thing for me. BULLCRAP, I asked my friends online, and they can do it if they wanted to. Grar! –still going to company Union meetings. Fight for the workers! But I joined because I love my company. There must be checks and balances in order to keep people happy, and maintain what’s right. I’m actually the Union secretary general. hah bet you didn’t know that. I never talked about it before. But I’m not going to miss that stuff, after I move back. –I gotta look up A) health insurance in the US B) cars C) banks D) confirm living place E)telling the immigration office Im leaving? Do I have to? –The electronic shop frick’n told me that I have to call Toshiba and mail away my old broken laptop to them in order to have them recycle it. omfg I’m spending SO MUCH MONEY just getting RID of my stuff. I’m tempted to just smash the hard drive to bits to destroy my info, and then dump it somewhere public, and screw society. I paid: $70 for my TV, $5 for my heater, $2 for my VCR, $5 for my suitcase, $2 wooden stand, $5 for my metal shelf/stand, something else I forget…. ug. 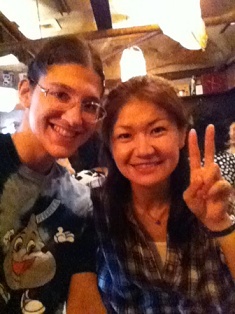 On Sunday, I met my former-student friend Mami. She treated me to a delicious ginger-based meal in Shinyuri. The ironic thing is that she said, “It’s on me.” and I said, “Really? Oh thank you so much.” And then… “You know, this feels familiar. Didn’t I teach you this way back when in Level five or six? We did role-plays of what to say when treating someone?” HAHAHAHAHA And she used it ON ME, 3 years later!! Hilarious. When her train pulled away, I cried. Today, I met Megumi (Fujii) for an afternoon snack. It was great to talk to her again and hear her plans for the future. I am SO relieved and happy that she’s going to do what SHE wants to do!! It’s about time it happened. I’m so excited for her. Did I mention that last week I met my host mother? We had a sushi lunch, and she gave me peaches! ;_; I was sad seeing her walk away…I wonder when I’ll get to see her again. 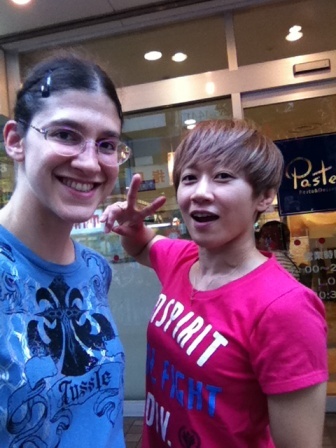 I also hung out with Kunioku-san, my former trainer, for lunch a little while back. Good to see him again, too. I hung out with Tsuruoka-san today for tea a bit, before heading over to Gold’s Gym to work out lightly, before meeting Megumi. Did I mention I’m sleeping like sh*t and waking up at 4 AM every morning? This Saturday I managed to get the day off, so I’m meeting one friend in the morning, and then going to the Ayu Matsuri festival with another in the afternoon. I’m so glad I can see two of my friends in one day…I need to. I’m running out of weekends! Almost every day on my calendar has something written on it. Then on Sunday, I have to work, and after that, meeting a few more friends. And every day my back hurts like a mother f. -_-; Mihara-san was great yesterday. But man, I need more adjustments. It comes and goes in waves, and this wave is certainly taking a long time to go away. *sigh* I know it’ll get better, though, but it’s still freaking me out. I’ve started rewatching Yoroiden Samurai Troopers (Ronin Warriors). It was actually my very first anime, before I even knew what anime was!! I was in middle school! SO after like five minutes of watching the first ep, I realized, ‘omg these subtitles are Chinese. It’s all in Japanese…” But you know, it’s freaking cool that it took a few minutes to realize it because I could understood what they were saying! What a dream come true! Seriously, THAT is a dream come true- I could watch my very first anime in it’s native language and understand 80% of it. Unfortunately, I couldn’t make money with my Japanese at work, but it was an enabling tool for other things. Wonderful friendships, getting around living in Japan, cultural understanding, opportunities, etc!